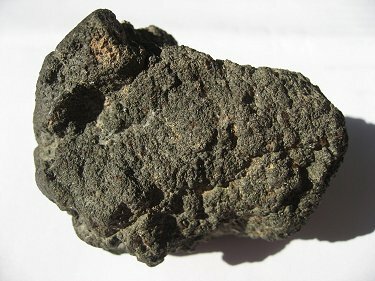 Complete main mass of NWA 6148. History and appearance: Two stones that weigh 270 g and fit together, were purchased in Erfoud, Morocco in 2009 By A. Aaronson. Petrography: (T. Bunch and J. Wittke, NAU): Millimeter-size euhedral augite and olivine (relative proportions, 85:15) are set in a glassy mesostasis of dendritic pyroxenes, acicular Ti-magnetite, and small grains of silica, feldspar, and phosphate. Olivine and augite are strongly zoned. Weathering and shock are both low. Geochemistry: Augite: cores, Fs 23.2 Wo 42 (FeO/MnO = 34); rims to Fa 41.5 Wo38. Olivine: cores, Fa 58 (FeO/MnO = 45); rims to Fa 74.5. 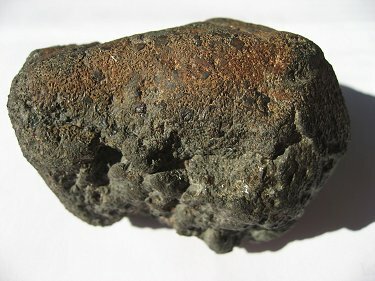 Mesostasis feldspar, An 12.3 – 16.7 Or 5. 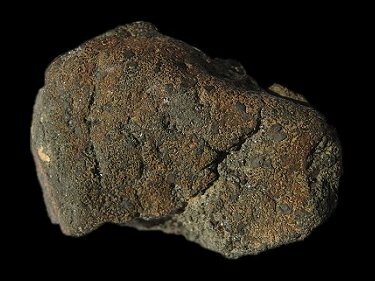 Classification: Martian meteorite (nakhlite); paired with NWA 5790. Specimens: A total of 20.2 g and one thin section are on deposit at UWB. Mr. P. Mani holds the main mass. C.-Y. Shih, L. E. Ny-quist, Y. Reese, and A. Jambon. (2010). Sm-Nd ISOTOPIC STUDIES OF TWO NAKHLITES, NWA 5790 AND NAKHLA. (abs#1367). T. Tomkinson, M. R. Lee, D. F. Mark and F. M. Stuart. (2012). TERRESTRIAL ORGANIC AND INORGANIC CONTAMINATION OF THE NWA 5790 NAKHLITE. (abs#5248). L. Huber, A. J. Irving, C. Maden and R. Wieler. SHERGOTTITES NWA 4797, NWA 5990, NWA 6342 AND NAKHLITE NWA 5790. (abs#1408). 250.99 gram uncut mass of NWA 6148 - View 1. 250.99 gram uncut mass of NWA 6148 - View 2.